Everybody has a podcast, but not everybody has as many famous friends as David Tennant does. 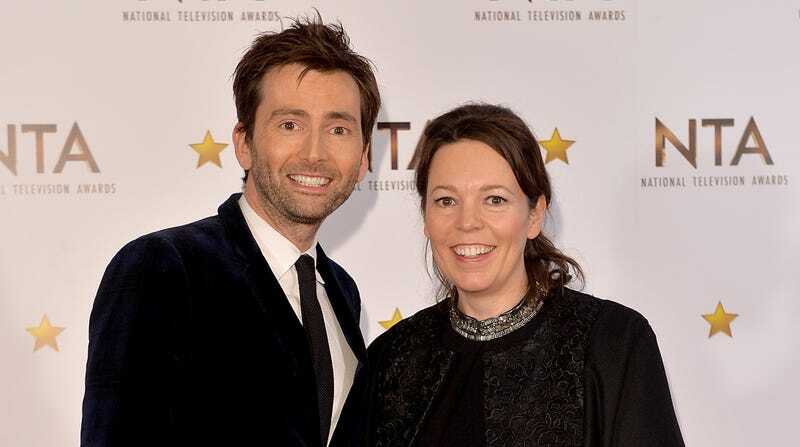 As reported by The Mary Sue, the former Doctor will launch his new podcast David Tennant Does A Podcast With… next Tuesday, and his first guest will be none other than his Broadchurch co-star Olivia Colman, who also happens to be an Academy Award nominee now. Apparently, they talk about what it was like working on Broadchurch together and how Colman filmed that “certain scene” with Emma Stone in The Favourite. Future guests include Michael Sheen, Krysten Ritter, Jodie Whittaker, Sir Ian McKellen, Whoopi Goldberg, Jon Hamm, Samantha Bee, and former Prime Minister Gordon Brown, many of whom either worked with Tennant in the past and/or now play the same time-traveling alien in a box who Tennant played a few years ago on a BBC sci-fi show. Tennant has teased the podcast with a freewheeling Twitter video that seems to imply the tone of the show will be similarly unstructured, but we’re just excited to finally hear Tennant discuss the virtues of meal kit delivery services and the various mattresses that fit inside a box the size of a mini fridge.